Google Web History is a service enabled by default when you create a Google account. It saves all your searches and the search results you click so you can quickly find them later and to help Google personalize results. It's called "Web History" instead of "Search History" because Google Toolbar has a feature that lets you send Google your browsing history. 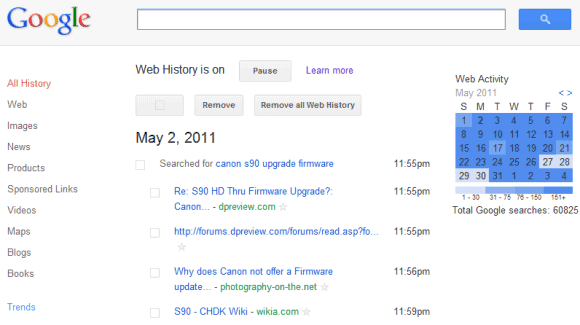 Google updated the Web History interface to make it more consistent and easier to use. The new interface seems to be optimized for removing searches, not for browsing your history. There's a huge checkbox button at the top of the page and a button for removing "all Web History". While it's nice to see that Google doesn't hide the button for deleting search/browsing history, using a button for such a rare and destructive action feels wrong. It's like placing a button labeled "Delete all your messages" in Gmail's toolbar. The previous interface included a special mode for removing items. When you clicked "remove items", Google added checkboxes next to the items and a "remove" button. The standard interface included star icons so you can quickly bookmark pages. Now the stars are a lot smaller and more difficult to see. It's likely that most people who visit Google Web History want to remove items or clear the entire history, not to search Web History or to bookmark pages. Looks nice! If only Chrome's History tab looked like that. I think I would prefer the calendar to be on the left hand side. An the buttons could afford to loose a few pixels as well. Through I am sure they are that big for touch screen devices. Also the tick boxes should be aligned up so that they are all in the same place, it looks messy at the moment. I be nice if there was some sought of share option that allow you to share links with Google+ friends. Apart from that I am liking all of the new designs so far. Even if they do lack the integration with Google services they need. i have mine turned off. i'm glad i have the option to change that though. I always find the Trends interesting, and it would be great to see them year by year rather than only the last 12 months and 'all time'. Got to agree with Jason. Wish Chrome's history tab looked like that. And I would prefer the calendar to be on the right hand side. Through I am sure too they are that big for touch screen devices. i have it turned off. it changed the original search result what i just want to turn out nature web result.